I have been thinking about those words for over a month now, words spoken by a young woman in Haiti just moments after giving her life to Christ. 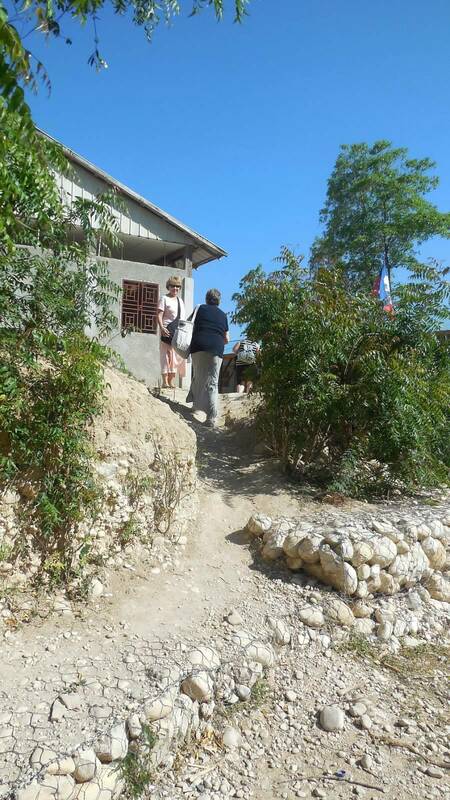 This past April I went to Haiti on a mission trip with a group from my church. Several days of our trip we traveled to a church in a small village called Babaco. 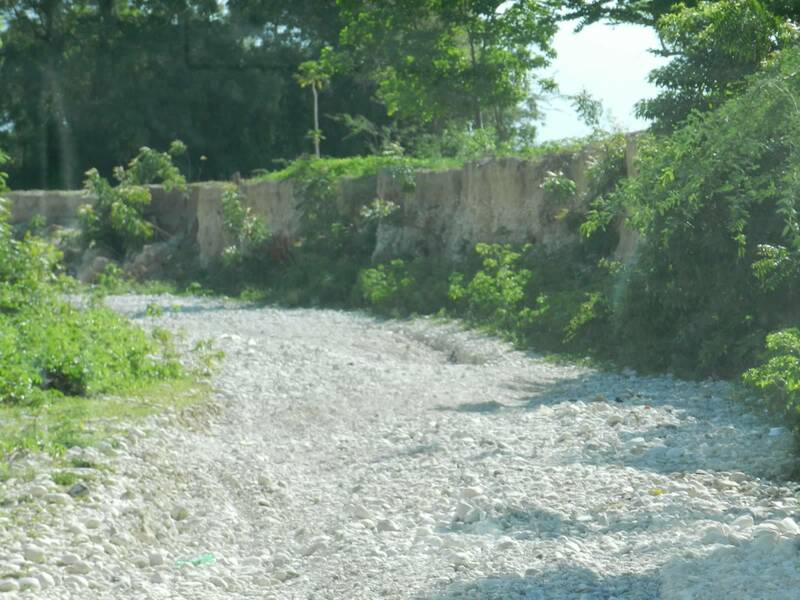 To get to Babaco we had to travel down a road which we found out used to be a river. We were told that during a Hurricane the river had somehow just disappeared. Nobody knows exactly where the river went but its completely dried up now and the church in Babaco is perched along what used to be its bank. 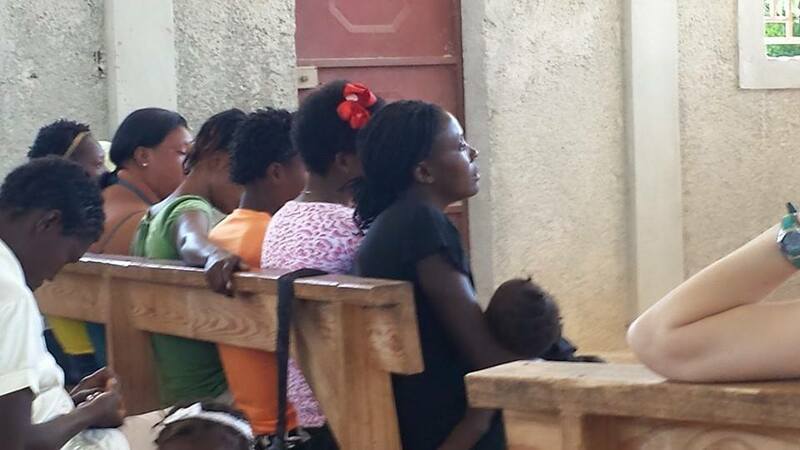 While at the church one of the things that our team did was we had a Bible study for the ladies of the village. Our pastor’s wife, Ellie, along with another lady from our church, Judy, taught the class while the rest of us would sit with the ladies who were attending. The first day of the class I was sitting in the back of the church when about 10 minutes into the class a woman with a baby came in the back door of the church. I happened to look up at her as she was walking in the door and we caught eyes. I smiled at her and she returned my smile with a big giant smile of her own and then she came over and sat down beside me. When I say she sat beside me that is actually a bit of an understatement because she didn’t just sit by me like a normal stranger would sit beside someone. Even though half of the wooden bench I was sitting on was empty she still sat just about as close to me as a person could sit to someone without actually sitting in their lap. She sat right up against me. As she sat down beside she spoke in Creole and even though I didn’t know her language or her mine we still understand each other. She told me her name and she asked me what my name was. She was very friendly and even though I do not usually like it when people to sit close to me, for some reason I felt immediately comfortable around her. Her baby was a boy and he looked to be a little over a year old. He was at the age where babies are just starting to toddle around and he was keeping his momma very busy that day. 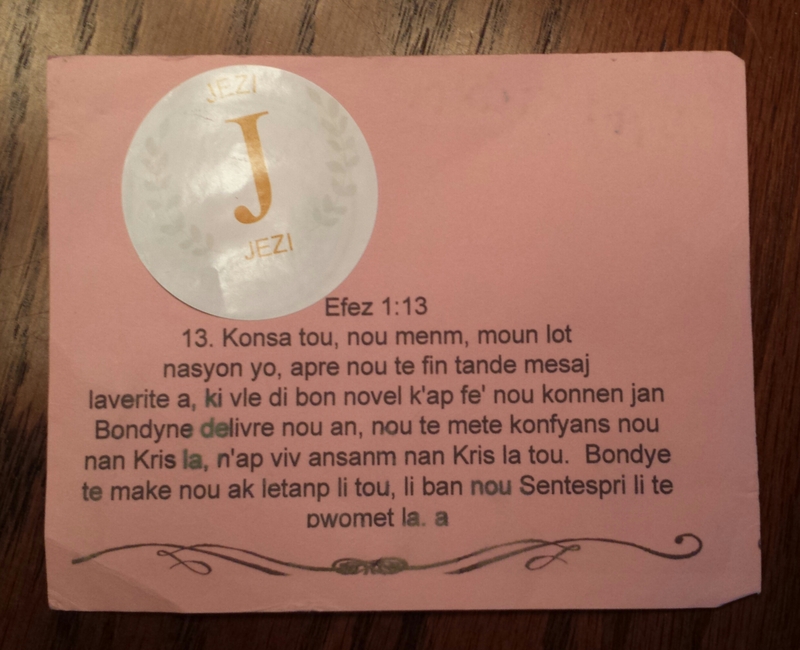 To me it looked as if for most of the class she wasn’t paying much attention to anything the teachers were saying, but then the teachers handed out pink index cards with the words of the Bible verse Ephesians 1:13 written on them. Once the cards were all handed out Judy read the verse to the ladies and she began explaining it to them, telling them that when a person asks Jesus into their life they become sealed, forever belonging to Him. As Judy spoke I noticed that the woman sitting next to me was now listening very intently and the more Judy talked about salvation I could feel that the woman was filling with excitement. Judy then told the ladies that they could write their names on the pink cards as a reminder. Right away the woman next to me wrote her name on her card. Judy talked a little more about salvation and told the ladies that she was going to be inviting anyone to the front of the room who would like to ask Jesus to come into their lives. By this point I could feel the woman’s emotion and could tell that she was really really excited and just about ready to spring out of her seat. When the invite to come up was finally given she immediately got up and went to the front of the room. Myself along with the rest of our team went up with her and we all prayed with her as she gave her life to Christ. She was the only lady who went up that day. I have seen people give their lives to Jesus before but for some reason this time it was very emotional. I am not sure if it was because we were on a mission trip or if it was just that I had never been involved in this sort of way before. Whatever it was I couldn’t contain my tears of joy, and from the sounds of the other ladies sniffing I knew I wasn’t the only one who felt that joy. After we were done praying we talked with her for a while and she told us that she usually didn’t come to church and she said the reason she didn’t come was because her clothes were not ‘good’ enough for church. And the story does not end here. Later that evening when we went back to our guest house, we told the missionaries we were staying with about the woman who was saved that day. When we told them her name they seemed really surprised at who it was. They told us that she was known as mean woman and that she was also known as a troublemaker in the village. Wow…. I found that so hard to believe because from the second I met her all I ever saw was a smiling, very sweet, and very friendly lady. I just can’t imagine her being a truly mean person and I wondered if maybe she was a troublemaker because she felt left out and maybe what was really going on was that she was hurting inside and maybe she behaved badly to cover for the hurt. I don’t really know her story but since I have came back home I have thought a lot about her and this has sparked me to think more about the people who are in my own neighborhood. Is it possible to that we could maybe be doing the same thing here? Could we also be keeping people out of church and ultimately God’s kingdom because of our attitudes? Do we have ideas about how people should behave or how they should dress for church? Do we label people with words like troublemaker and then let them keep that label forever? Who decided that it’s up to anybody to decide anything about anybody else anyway? What would you do if a known troublemaker walked into your church? What if his clothing were ratty or dirty? Better yet, what if his breath smelled of alcohol? Okay so you’ve let him in, but would you smile at him? Would you go sit by him? Would you be his friend? The answer is yes right? And in order for others to know Him we have to invite and truly welcome everyone in. 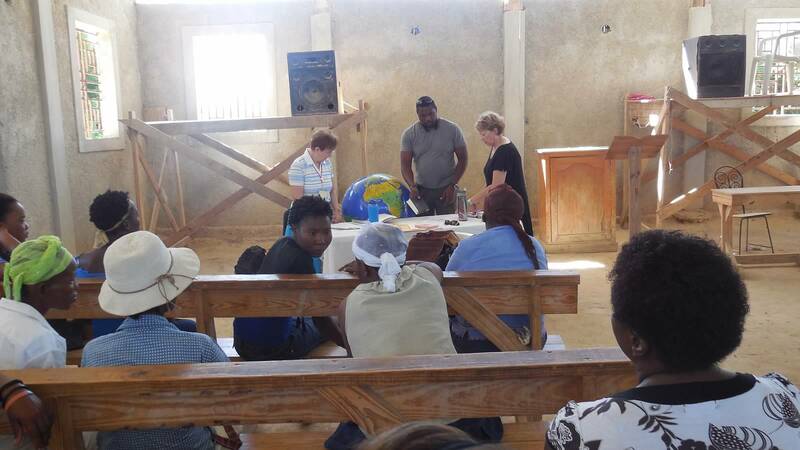 The next day we went back to the church in Babaco for another ladies Bible study. That day the woman came to class on time and she seemed different that day. This time she didn’t sit in the back, instead she walked straight up to the front row and sat down. I could tell by the way she held herself she felt confident that she belonged in the church and she also knew she belonged in the front row. She didn’t belong the troublemaker label anymore and she knew the clothing she wore was perfect because now… She was included in Christ when she heard the message of truth, the gospel of her salvation. When she believed, she was marked in him with a seal, the promised Holy Spirit. She now belongs to Jesus. So great to see her sitting in the front row! Yes is was, that was so awesome when she did that! Thanks for reading and commenting! It was an awesome day! Thanks! Thanks for writing this post. My compassion child in Haiti once wrote those words to me. He said he stopped going to church because his clothes were not good enough. What he didn’t know was that I recently sent him a gift (money) what I didn’t know at the time was that he needed it to buy clothes. He bought clothes and shoes and was able to return to church. Amazing story thanks for sharing. Wow! that It’s so awesome how God provided through you when you didn’t even know at the time that your child needed those clothes! God is so amazing, and I am so glad that you were able to help him. What a wonderful story! Thank you so much for sharing it and also for coming by my blog. Isn’t it great how Jesus will break through the barriers we place on ourselves or on others? It’s sad when those barriers stand in the way. But, just as you wrote with this story, there is hope. Yes it is so so great how he can break the barriers down, I am so thankful for that! Thank you so much for coming by and for your comment. I think you are right, I used to feel that way myself, that I was not good enough, but now I know better 🙂 Thanks so much! Beautiful!!!!! It’s so amazing how God works! Thanks for sharing. Yes it is amazing how he works, and he continues to amaze me over and over! Thank you!